Very popular is the Costa Adeje, a great championship course that is 5889m (from yellow) with Par 72. The big advantage: it is reachable from Casa Felix by car in 20 minutes. If you have less time or want to do something less challenging, you can play the smaller 9 hole golf course “Los Lagos”. It is 1865 m (from yellow) with Par 33. 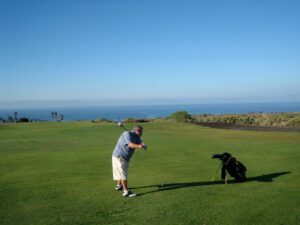 A trip to the north takes you to the Buenavista Golf Course. With spectacular view along the rugged North coast, this is not to be missed. We have two full sets of golf clubs and equipment available for guests to borrow.